QTS Realty Trust last week officially launched a new data center in Northern Virginia, as the facility’s anchor tenant, a US-based financial services company, was completing move-in. The launch and the data center’s first tenant are notable because most of the wholesale data center leases closed in recent years in Northern Virginia – by far the largest and most active data center market in the US, and possibly in the world – have been by companies operating hyperscale cloud platforms. Those are the likes of Amazon Web Services, Microsoft Azure, and Google Cloud Platform. While hyperscale cloud has for the last few years been the primary growth engine for wholesale data center providers, the deal illustrates that enterprise end users, too, are leasing capacity in sizable chunks, as they rethink their technology infrastructure, which is increasingly a mix of their own IT gear inside leased or owned data centers and cloud services. To be sure, enterprise clients aren’t QTS’s only focus in Ashburn, the Northern Virginia market’s epicenter, where the company’s new facility is located. In fact, design, manner of build-out, cost structure, and pricing at the site are all geared toward hyperscale clients, Tag Greason, the company’s chief hyperscale officer, said in an interview with Data Center Knowledge. Wholesale data center landlords (companies that lease space and power in large chunks, 1MW and up) rented out more than 120MW of capacity in Northern Virginia last year – about double what was absorbed in Silicon Valley, America’s second-largest data center market, and more than in any other single region in the world, according to a report by the commercial real estate services firm CBRE. Northern Virginia was responsible for more than 60 percent of all wholesale data center capacity leased in the US in 2017, the report said. CBRE credited hyperscale cloud platforms with last year’s record wholesale data center inventory absorption in the country. But the more traditional enterprise clients – companies in financial services, healthcare, retail, and so on – are also increasingly turning to data center leases. They do it for a variety of reasons, which include wanting to take expensive real-estate assets off the books by closing owned data centers, consolidating infrastructure, getting into facilities where they can interconnect with partners and service providers, and various combinations of all the above. The first tenant in QTS’s new Ashburn data center is consolidating. The financial services company, whom QTS hasn’t named, is going from two leased and two owned data centers on the East Coast to one leased facility (the QTS site) and one owned, Greason said. Ashburn is its first Northern Virginia location. In addition to wholesale (or what it calls “hyperscale”) data center leases, Overland Park, Kansas-based QTS provides retail colocation services combined with higher-level cloud and managed services solutions. It recently restructured the business and revamped its product portfolio, splitting it into two broad categories: hyperscale and hybrid colocation. The lease to its anchor tenant in Ashburn would fall into the hyperscale category. The tenant took one of four data halls QTS launched at the site. Each data hall is about 14,000 square feet and 2MW of power, Greason said. The building is three stories. 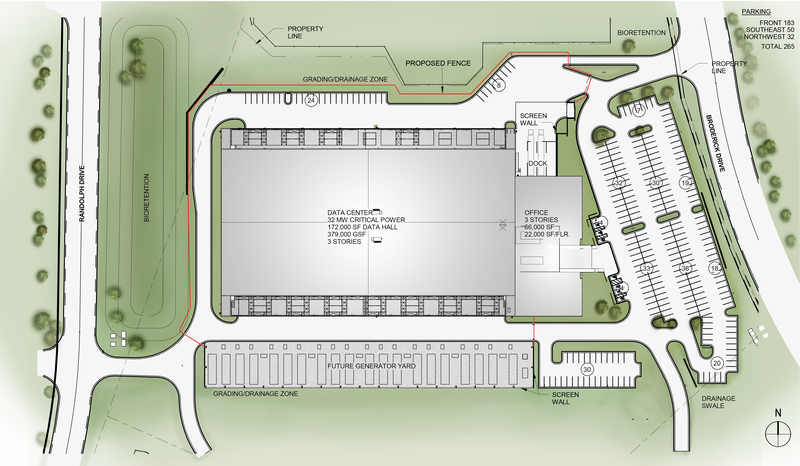 QTS claims it’s the first three-story data center in Northern Virginia, which is notable because real estate is extremely tight and expensive in one of the world’s hottest data center markets and building upward is a way to get more inventory out of every square foot of land. The four initial data halls, including a “spine” with electrical and mechanical infrastructure running down the middle, occupy the entire first floor. The plan is to replicate the design on each of the two remaining stories, Greason said. Generators and cooling infrastructure are outside of the building. The design will allow QTS to accelerate delivery. The landlord can have one 8MW quadrant up and running, while building out the next one without disruption to existing customers, he explained. Speed with which a data center provider can deliver new capacity has become an essential factor in winning hyperscale cloud deals. In this instance, even though the financial services company is not a cloud provider, QTS was still under pressure to deliver quickly. Expiration of the client’s leases with its other two other data center providers was fast approaching, Greason said. On an accelerated schedule, QTS delivered the capacity in 10 months, shaving two months off its original 12-month plan. “It’s the first time that we’ve done it in 10 months,” he said. As the frenzy to build as much data center space in Northern Virginia as possible continues, QTS faces some stiff competition in the region. The market’s wholesale data center vacancy rate was just below 6 percent as of the end of last year, CBRE estimated, but another 86MW was under construction. Recent activity includes the announcement by Digital Realty Trust, the region’s biggest player, of acquisition of a 62-acre parcel 20 miles south of Ashburn, in Manassas; CoreSite Realty Corp.’s zoning approval to build up to 50MW in neighboring Reston; Infomart Data Centers’ completion of the first of six planned 3MW data center suites in Ashburn proper; and the commencement of construction by Sabey Data Centers of the second, 22MW building on its Ashburn campus. As it fights for its share of this ballooning East Coast market, QTS is betting on its now substantial land holdings in the region and its ability to deliver capacity quickly, with what Greason described as “hyperscale economics.” Essentially, that means providing a lot of data center space faster and cheaper than the hyperscalers can do on their own.